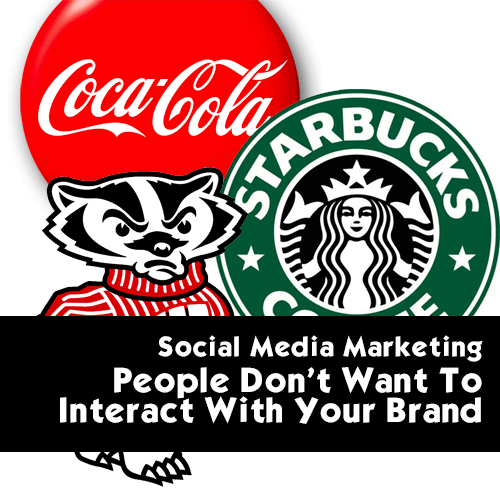 I think that MOST people do not want to interact with MOST brands. That creates a large gap between business and their customers. If you are taking time to build a business page, obsessing over how many likes and trying to keep your profile separate from your biz page, you may be wasting time and shooting yourself in the foot! So does that mean I think you don’t have to have a business page or that you shouldn’t post business pictures on Pinterest, not just no, but hell no. Potential customers are checking out your business on the internet and if you are missing or haven’t posted in months I guarantee they will move on to a more connected company. What I am saying, is that as a small business, you HAVE to be the face of your company! Mashable has Pete Cashmore, Amazon has Jeff Bezos, Wendy’s had Dave Thomas, the lists go on and on. While customers like using the products and services of a company, the fall in LOVE with the person who is the face and soul of it. Can you pay someone to interact with your brand? So what about if you try harder, spend more and shout about your business. Wouldn’t all that attention FORCE the market to notice your business? Can’t you just buy attention? My husband interacts with the Wisconsin Badgers and the Minnesota Vikings. He grew up in Minnesota and went to the University of Wisconsin. He is an “Apple” guy who owns every computer, phone, iPad, etc. on the planet and has to order the new ones on the first day. He shoots photos with his Nikon camera and drives a Jeep (we had one before, sold it and then had to get another one). So what if we decided that we would try and make him a Cowboys fan, driving a Subaru with a Windows phone in his hand and Canon on his hip? We could slather him with Facebook ads touting the benefits of Subaru, Google Adwords him to death with Windows ads and stream Dallas highlights to him on his phone 24 hours, 7 days a week. Do you think that will change his mind or his habits? Nope, probably will just annoy him that we were interrupting his fabulous life with things that didn’t add anything and were generally distracting to him. So what should you do? You can’t spend your way out, you can’t yell your way out, you need a strong social media marketing plan that will allow you to grow a following, send out relevant and interesting content and MAYBE sell stuff. Generally your social media marketing should be filling your sales funnel, NOT acting as a salesman!! If you would like to find out more, check out our social media marketing services or call us today 727-415-9165!